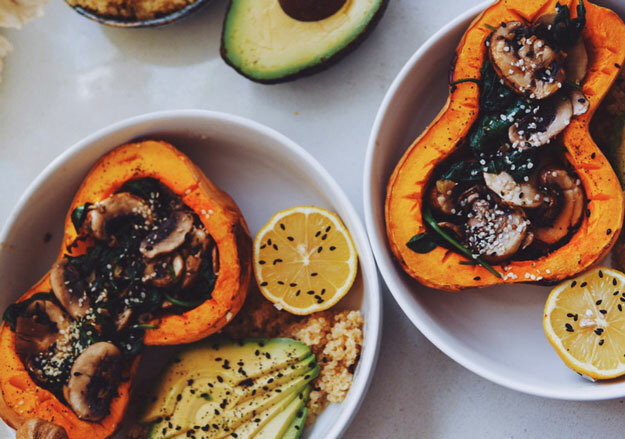 An impressive gluten-free spinach & mushroom stuffed butternut squash recipe that you’ll be gushing over. Vegans and those that are gluten-free have to get creative with recipes because of limited ingredients. Fortunately, when your back is against the wall, unique and delicious recipes come out of the cracks. One of these fantastic recipes makes its way to us thanks to KitchenBowl user jelena_sequoia. 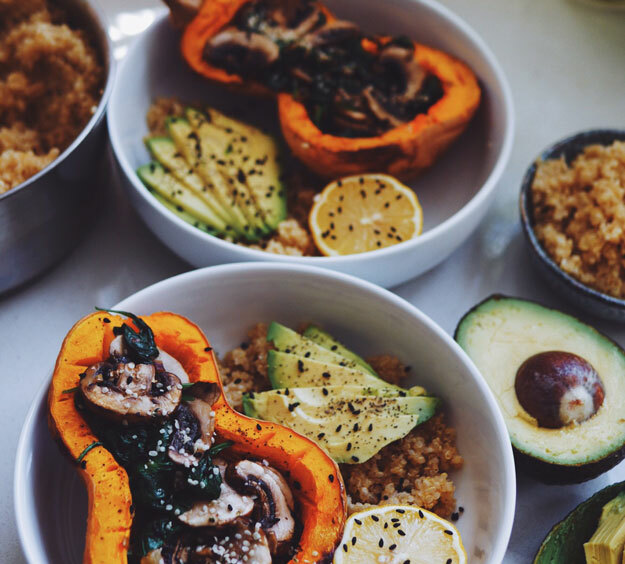 Feast your eyes on this wonderful spinach & mushroom stuffed butternut squash recipe, paired with slices of avocado over a bed of warm and fluffy quinoa. Eating healthy can be wonderful sometimes. Start by rinsing the quinoa in a sieve until the water is clear. 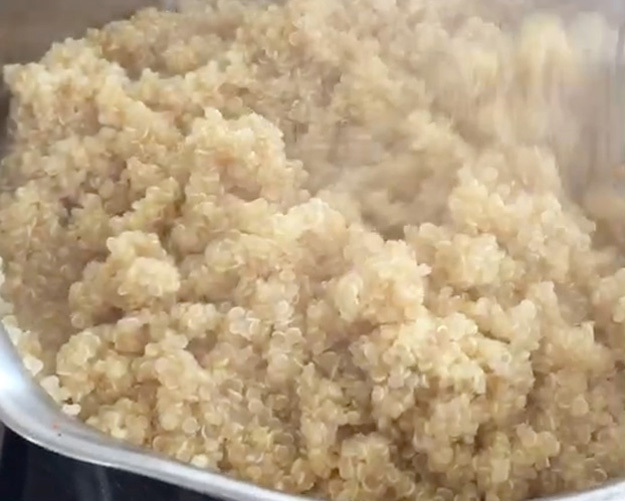 Drain and transfer the quinoa to a medium-sized pot. Add 2 cups of water (and a bit of salt if wanted) and bring to a boil. Cover the pot, reduce heat to medium and let it simmer for 15 to 20 minutes, or until the water is absorbed. Next, cut the butternut squash in half, drizzle it with oil and bake in the oven for 30 minutes. 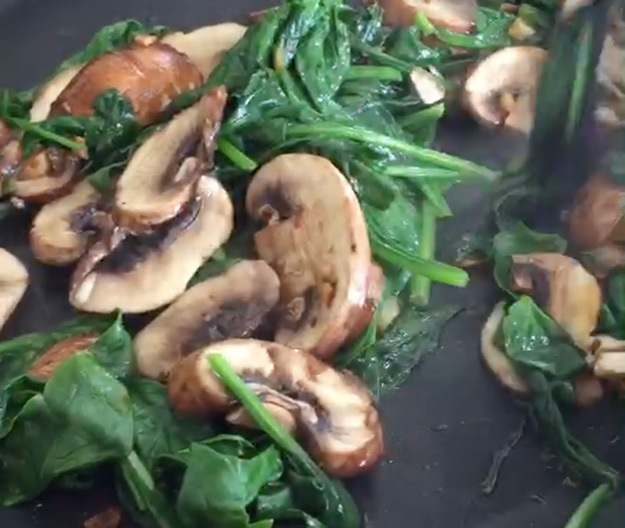 While this is baking, heat up oil in a pan and cook the minced garlic, spinach and mushroom. You’ll know your butternut squash is done when you can easily cut it with a fork. Grab the spinach/mushroom/garlic mixture and spoon it into the squash. Serve it with slices of avocado and half a lemon over a bed of quinoa. Top with black sesame and hemp seeds. Enjoy!